Your giveaways are super exciting!!! Would love to win! I love couponing at Target!! I love your site as much as I love Target! Cool giftcard! Thanks for the chance to win! Love the card! And your site! i already like tt on fb..
What a great card! Thanks for all your advice and giveaways. Really like your FB page. Fun… I’ve never seen a Target card this cool. i would love to win this gift card.. Already a FB fan. Thanks again. Already like (love) you on FB. Thanks for all you do! Hope I win this gift card!! $50 for target wow! love it! Oh….I would LOVE to win this! Thanks for the opportunity! Thank you for the chance at this cool card. I’m a fan of Totally Target on Facebook! How great would a $50 gift card be!!! 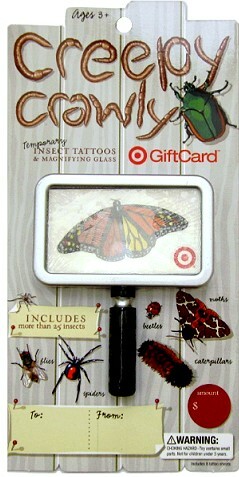 And my 6 year old daughter would love the magnifying glass! Better luck this time I hope. I LOVE TARGET! I could really use this to buy my baby some clothes!! Thanks! Love your Site!! And I love TARGET!!!! Thanks for the chance to win – love your blog!